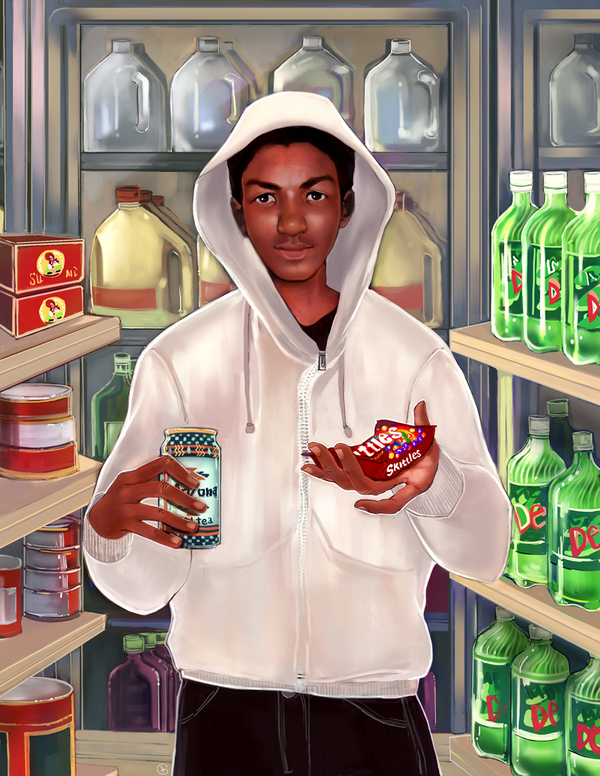 You could say that this painting could also be known as Saint Trayvon of the Seven Eleven. Trayvon was no saint, but he was a real live 17-year-old boy, once upon a time. In this painting, his dark gray hoodie is white as snow, the fatal bullet wound is nonexistent, and he seems to be offering his Skittles and Arizona ice tea like the bread and wine offered by Jesus before his Passion on the cross. His hoodie is up and it surrounds his young face like a halo. He’s surrounded by the most innocuous of products: gallons of milk, liters of soda, coffee cans, quickie canned foods like Spaghetti-hs, and raisins. Who is Andrea Montano? Tonight was the first time I have ever heard of her. An FB friend from the Strongface Literary Group and Book Club passed this along to her followers, and in the mood that I am in about this young man who could be anyone’s son, I’ve decided to show him in the panes for the duration of the trial that may end in the conviction of his murderer, George Zimmerman. Montano’s webpage is here. From all indications, she is a talented illustrator, a storyboard/storyteller, and a cartoonist, and she has a Tumblr page. I do like her work. Thank you, Andrea, and I wish you well.